Established more than 40 years ago, the COM Basic Peace Officer Academy forms the cornerstone of the COM Law Enforcement Program. With 730+ hours of instruction, the semester-long academy meets the training requirements of the Texas Commission on Law Enforcement. 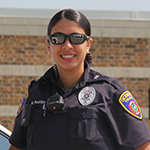 - Basic Peace Officer Academy graduate Karen Rodriguez works for the Dickinson Police Department.